With all the attention he's gotten over the years for the various things he's done off camera, Charlie sheen should be glad that this column only focuses on his body of work. Interestingly, I can actually pinpoint the moment I became aware of who he was. I was 10, watching an Amazing Stories marathon on my new favorite the Sci-Fi Channel (SyFy, is a stupid rebrand) and my sister informed me that he was someone outside of that episode. I found that episode boring. Not a great first impression. A quick rundown of how this all works for anyone new. I take all the films an actor or actress has been in and break them down into three categories, 'Good' 'Bad' and 'Ok.' I do not count TV appearances or Made for TV movies. Afterwards a quick analysis will show whether or not they're a good actor by the numbers. Invariably there is a 2-3 +/- point bias on a person to person basis. Also, since 'ok' movies are not bad they count towards the positive column in the overall figuring. If by the numbers they fall in the 50 - 60% range, they're a bad actor; 61 - 70% good actor, and 71 - 80% great actor. Anything higher is unlikely, but will be classified as "elite." Tsk, tsk, tsk. Last week I was nice to his late Red Dawn costar. Today I'm straight up no nonsense again. I knew early on that this was not good for him. He should have learned early on that working with his brother does not equal good. Well, maybe with the exception of Young Guns, but then I always felt the wrong brother died in that movie. 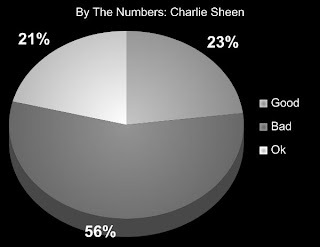 So with 56% negative over 44% positive (ouch) Charlie Sheen is officially in the 'bad' column. Look, Charlie, despite my tone in this, I do like you occasionally. You can be funny in the right role, and actually can act when you feel up to it. But as long as you continue to load up on "Scary Movies" you're just never going to rate any better. Thanks to Pat for this week's choice! I think you hit it right on the head. In a comedy setting he comes off okay, and did in fact score some biggies there. But in a dramatic setting, he pretty much blows! "Platoon" for instance...that movie got tons of award nominations, by every group that hands them out. Oh yeah, except for best actor...he got exactly zero nominations. Talk about a weak link! To me, he's one of those guys who plays the same character in every single role. In my humble opinion. Poor little Charlie. Maybe if I'd seen you in something other than Friends and Platoon, I'd be able to come to your defense. I may have seen you in other things, but clearly no impression was made. And since I have complete blind faith in TS's entertainment assessments, I'm afraid you're a bad actor. Sorry. I think you were more than fair with this. All of his cheesy movies are the first ones that come to mind when I think of him, especially that train wreck Men at Work with his equally talentless brother, Emilo. I think the first time I saw him was in Ferris Bueller's Day Off. I've never been a fan. Dramatic Charlie wasn't bad early on. Platoon, Wall St. Ferris B. I'd say now he's too much of a goof to play nicely in that genre. I can't stand him... For real. Just saying. Charlie ain't no Martin...that's all there is to say. Two Men and a Baby or a Pizza Place or something is enough to turn the bad percentage into 123%, with 0% margin of error.